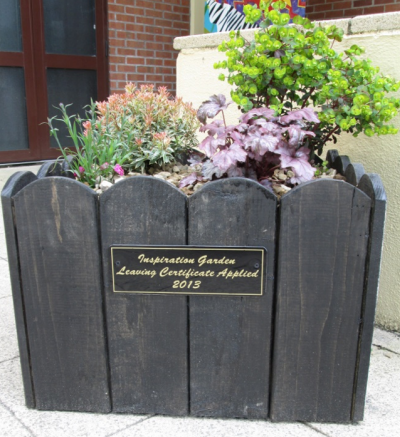 A Gardening project undertaken by Leaving Certificate Applied students of St. Aidan’s Comprehensive School, Cootehill has resulted in the new St. Aidan’s Inspiration Garden. The garden was designed and completed by the students as part of the Agriculture and Horticulture module studied as a vocational specialism in the LCA programme. The school’s entrance is now surrounded with floral inspiration supplied by this rockery garden containing inspirational stones with words encouragement to others. We at St. Aidan’s are delighted with the latest addition to our School Garden and would like to thank our LCA students; Jason Byrd, Aine Costin, Mark Jenkins, Christopher Joyce, Orla McCullagh and Michael McGibney for their hard work and dedication to the project and wish them every success in their upcoming Leaving Certificate exams.